Here is a view of the Thames as the sun set last Saturday at the end of the 10-hour, 10-pub psychogeography walk run by Minimum Labyrinth, based on Peter Ackroyd's books about London. 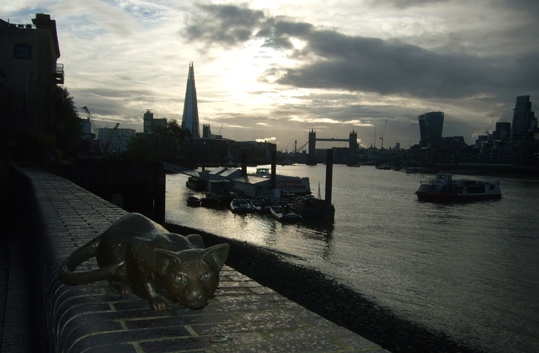 I took the photo at Bermondsey and the cat in the foreground is part of a group of statues called Dr Salter's Daydream, which commemorates Dr Salter and his wife - a local couple who dedicated their lives to helping the local community. This is one of my favourite parts of the Thames. It is much less crowded than the banks of the river in Central London and very atmospheric. There are good pubs there too, including the Angel and the Mayflower, which were the last two drinking stops at the end of the pub crawl.